The government shutdown this week for the first time in nearly two decades. Over the course of debates Republicans have shifted their story several times. First they wanted to shutdown the government unless funding was cut for the Affordable Care Act. Then they wanted to delay the president's signature law. Once that failed and the government shut down they pushed for a piecemeal method of funding the government, cherry picking the projects they deemed fit to fund so that they could save face in the media. When that didn't work they broke into closed parks to let tourists in and posed for photo ops blaming the president all the while ignoring the fact that they previously argued that a government shutdown would be a great thing. What is interesting about all of these accounts is that they really don't represent the GOP's true intentions. What does is this quote from Indiana Representative Marlin Stutzman: "We're not going to be disrespected, we have to get something out of this. And I don't know what that even is." 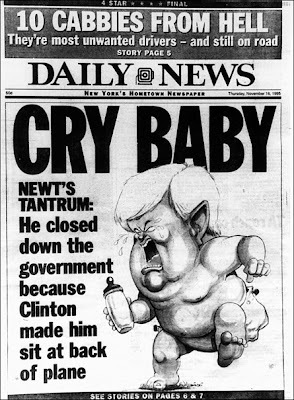 This is very reminiscent of the last shutdowns when then-Speaker Newt Gingrich stated he helped grind the government to a halt when he felt snubbed by President Bill Clinton on a plane ride on Air Force One. "When you land at Andrews [Air Base] and you've been on the plane for 25 hours and nobody has talked to you and they ask you to get off by the back ramp so the media won't picture the Senate majority leader and the speaker of the House returning from Israel, you just wonder, where's their sense of manners, where's their sense of courtesy?" 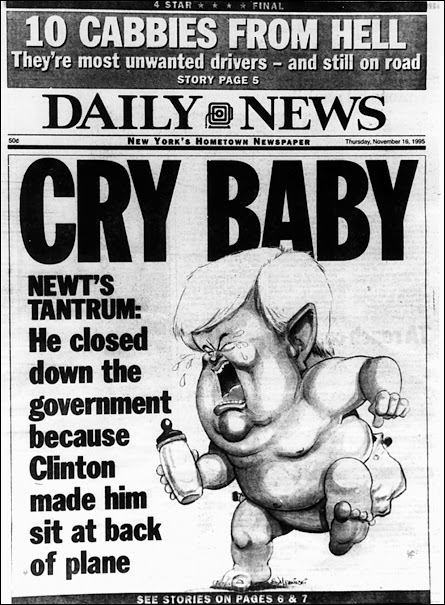 Gingrich said. "Had they just been asleep all night and it hadn't occurred to them that maybe Bob Dole deserved the dignity of walking down the front ramp? Forget me -- I'm only speaker of the House. But you just have to say to yourself, was it a deliberate calculated aloofness or just total incompetence?" Stutzman's comments are horrifyingly similar and rings true the cries of hostage taking- the GOP shutdown the government because they felt disrespected because nobody would pass their legislation and now they want something in return in order for them to help restore our nation.